Detroit “public auction” advertised on freeway side of now abandoned Herman Kiefer Health Complex. 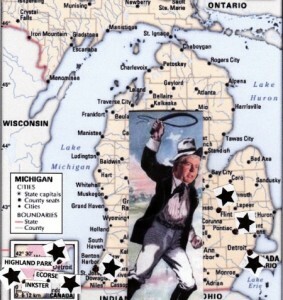 Slavemaster Rick Snyder has devastated Black cities across Michigan with similar asset sales through Emergency Managers. No one from the federal level on down has taken massive action to stop the racist divestment. 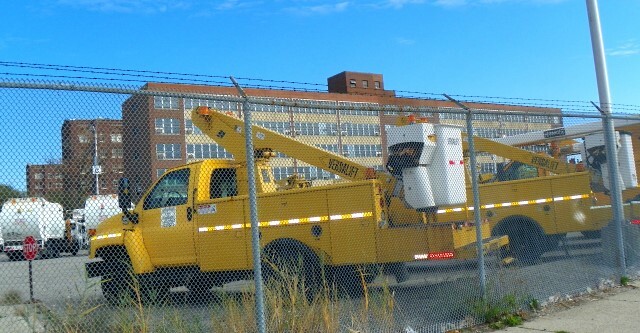 DETROIT – The City of Detroit, a/k/a Emergency Manager Kevyn Orr and his appointed COO Gary Brown, will auction “more than 450 surplus vehicles it no longer needs. Despite no longer being needed by the city, many of these pieces of equipment can serve private contractors or other municipalities well for years to come,” according to a release on the city’s website. 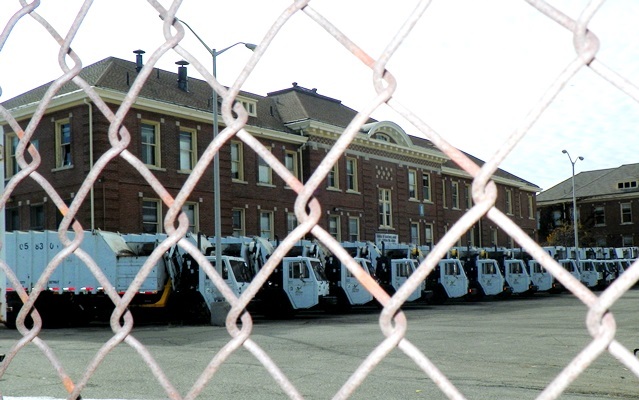 DPW trucks lined up outside HKHC Building 1, which used to house substance abuse treatment services. 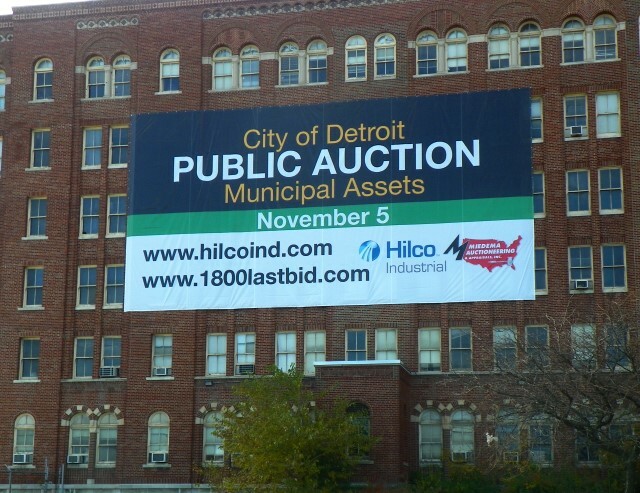 A large banner strung across the John Lodge Freeway side of the now abandoned Herman Kiefer Health Complex advertises the online auction, set for Nov. 5 and 13. Parking lots there currently house assets from the Public Lighting and Public Works departments. “Many of these vehicles are in very good working order and have a lot of life left in them,” said Gary Brown, City of Detroit Chief Operating Officer. 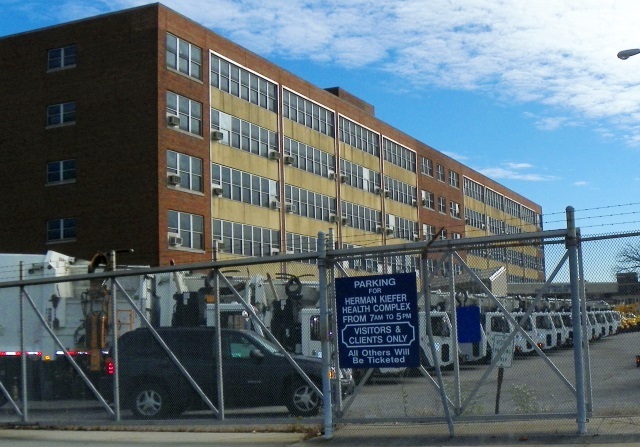 DPW vehicles block former entrance to Herman Kiefer Family Health Center, an adult medical clinic which provided doctors, nurses, prescriptions and other services to low-income Detroiters. So did the jobs of over 165 DPW workers, replaced by the for-profit Rizzo Environmental Services, based in suburban Sterling Heights, and Advanced Disposal Services, with corporate offices in Ponte Vedra, Florida. The companies may as well have been holding slave auctions. The City Council gave them these jobs and a contract for a rock bottom price of $122 million. 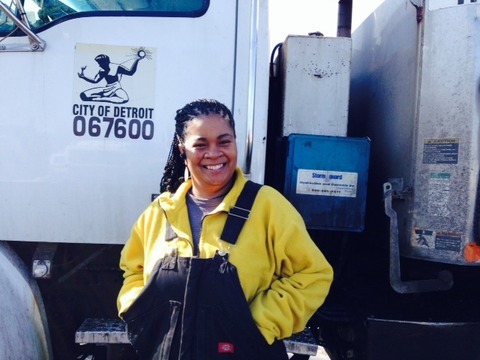 Long-time DPW worker LaDonna Nash told the WSWS newspaper (see link below), “If the new managers don’t like you, then you’re in trouble. All of the buildings here are going to be sold. The work for container repair, forestry, parks and recreation; all of it is going to private companies. PLD vehicle parked in lot in front of Building 7, where Community Health Field Services including home visits by nurses, was originally located. EM Orr told DTE the entire Public Lighting Department, including its revenue-generating provision of lighting to public buildings, will be phased out over the next five years to DTE, which has already taken over PLD’s electricity grid. The newly-founded regional Public Lighting Authority plans to dismantle 46,000 of the city’s 88,000 streetlights, in areas targeted for “blight (i.e. Black) removal,” according to Orr’s May 12, 2013 Financial and Operating Plan. PLD was founded in the 1920’s and was originally meant to provide electricity to the entire city, including its residences. The city’s former Auditor General reported several years ago that those service lines could have been revamped to provide revenue-generating, public cable TV service to city residents at lower costs. DPW and PLD vehicles pack parking lot which used to provide space for patients of the Herman Kiefer Family Health Center. PLD has been one of few opportunities for Black and women skilled trades workers such as electricians to get long-term employment. Profit from the auctions is to be used to “pay down debt,” with some allegedly restored to the departments, according to an Oct. 30 article in the Monitor. Considering there will be no DPW or PLD, it is clear only the banks will profit from these auctions. 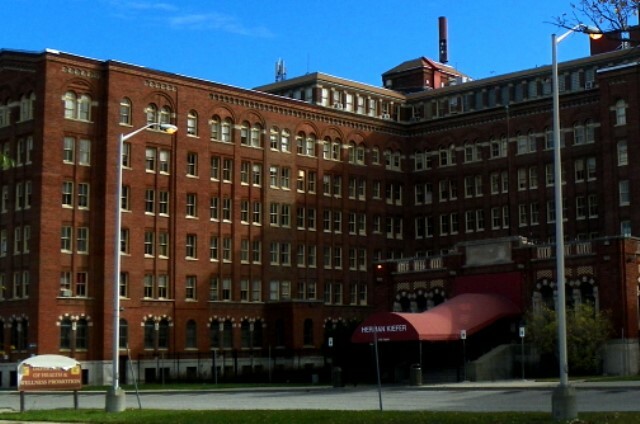 Herman Kiefer formerly housed the Detroit Health and Wellness Department. The Health Department served the people of Detroit beginning in 1825, running three hospitals and five clinics, as well as coordinating a home physician visit program. Freeway entrance to HKHC still displays sign showing some of services no longer provided there. One of its hospitals, Detroit General, founded in 1918, was privatized in 1980 when it was transferred to the Detroit Medical Center and became Detroit Receiving Hospital. Detroit Mayor Mike Duggan, then DMC CEO, sold the DMC to Vanguard Health, 70 percent owned by the Blackstone Hedge Fund. Vanguard then sold it to Tenet. Receiving is now laying off most of its custodial staff. Over four hundred workers there were laid off when the Health Department was handed over to the private Institute for Population Health (IPH) in May, 2012, during the fall-out from the “Consent Agreement” that led to the appointment of Detroit Emergency Manager Kevyn Orr. 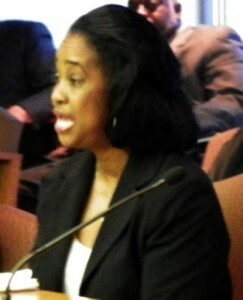 AFSCME Health Department Local 457 President Laurie Walker testifies at City Council May 6, 2012. The IPH has now itself gone bust. 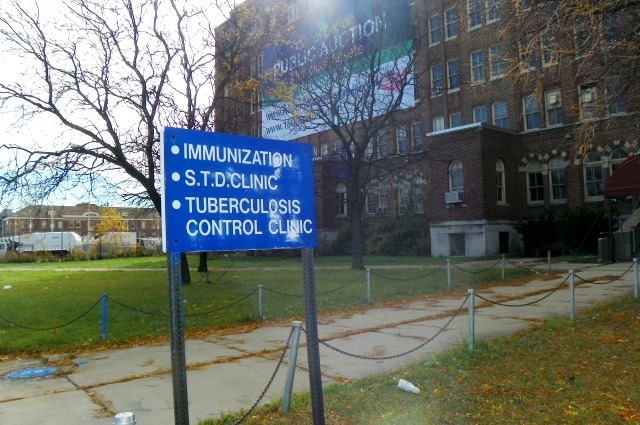 Nearly all the services at the Health Department were paid for by federal grants, which the City of Detroit lost as a result. In recent decades, the Department provided Maternal and Infant Health Programs, in a city where the 2009 infant mortality rate was 14.8 per 1,000, more than double the national average of 6.3 per 1,000. It provided WIC (a federal food program for women, infants and children), immunizations, lead screening, vision and hearing testing, family planning, nurse home visits, and substance abuse treatment among other services. Its vital records division and adult and pediatric dental clinics were self-sustaining through fees. The Council, at the request of former Mayor Dave Bing, also got rid of the federally-funded Detroit Human Services and Workforce Development Departments and their employees, along with the grants. The city release also says that 79 transit buses and “historic” trolley cars will be auctioned off. Although the Detroit Department of Transportation still exists, largely because of federal regulations preventing replacement of unionized employees, the eventual plan is to fold it into the Detroit Regional Transit Authority. 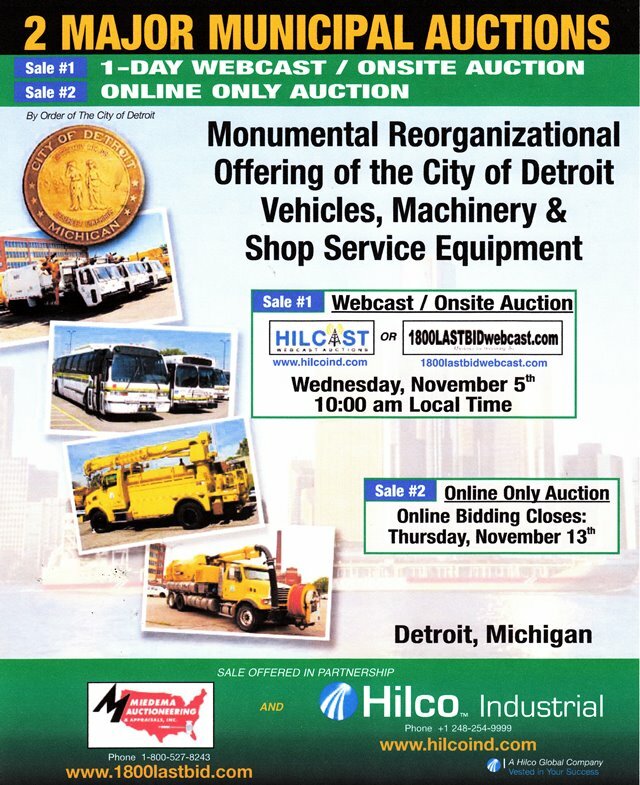 The contract for the auction has been awarded to Hilco Industrial, a global corporation headquartered in Birmingham, Alabama, and Miedema Auctioneering and Appraisals, headquartered in Byron Center, Michigan. Both companies are white-owned and show only white executives on their staff. On Oct. 27, Municipal Market Advisors said such asset sell-offs, among other factors, are likely to lead to a second Chapter 9 bankruptcy filing almost as soon as Detroit exits the first. 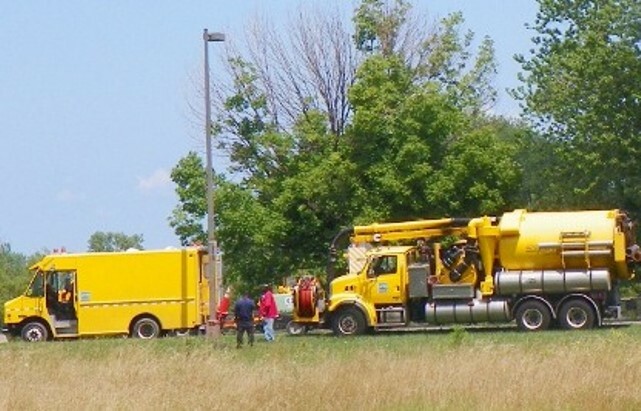 Public Lighting Department workers fixing street lights on Belle Isle July 29, 2012. Under pretense of a 30-yr. renewable $0 “lease,” the State of Michigan has also stolen Belle Isle from Detroiters. Gov. Rick Snyder’s aide told Councilwoman JoAnn Watson he wanted Belle Isle directly after he took office. This writer went out for a bike ride on Belle Isle after finishing this article. There were hardly any streetlights working on the entire island. The bridge lights were on, and lights around the casino, but only a few others blinked on as the island got dark. D-DOT no longer operates bus routes on the island. My bike ride began while it was still light, but there were hardly any people out to enjoy the beautiful day, in cars, on foot, or on bicycles. NIGHTMARE!